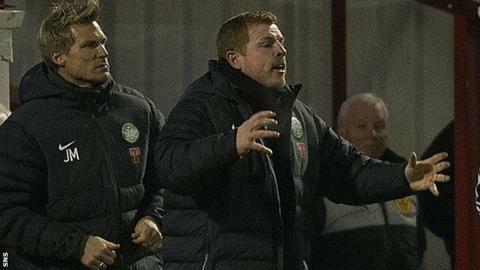 Manager Neil Lennon was furious with his underperforming Celtic team following a 2-1 loss at Motherwell. Lennon made five changes ahead of cup ties against St Mirren and Juventus, leaving top-scorer Gary Hooper on the substitutes' bench. "People keep coming to me wanting to play games, people keep saying I should use the squad," said an angry Lennon. "But then if you leave the likes of Hooper and Joe Ledley out, it seems to me we look a little short at times." Michael Higdon volleyed the winner in the 73rd minute as Motherwell beat Celtic for the first time in exactly two years. Chris Humphrey had opened the scoring prior to the break, before Georgios Samaras headed an equaliser for the visitors. "At 1-1, I was thinking we'll go and win this now," Lennon explained to BBC Radio Scotland. "We were comfortable, we were in control." The winning goal came as Efe Ambrose and Adam Matthews got in each other's way in the right-back position and Nicky Law broke away to set up Higdon. "Another basic error has cost us," fumed Lennon. "Even after Motherwell went ahead again we had chances to get back into the game. "I thought James Forrest was magnificent for the whole game; he was the one stand-out in the team. "Victor Wanyama and Thomas Rogne had decent games but the rest fell short of the standard required. "Maybe I need to look at myself and my team selection. I've got other games in mind but I was expecting to come here and win the game. "Our attacking play was insipid in the first half; lazy. That's not good enough. There was a lack of desire, a lack of hunger. "The second half was marginally better. We got a good goal but then we drop a clanger again for Motherwell's second - making life hard for ourselves. "The players need to know that is not acceptable." After a fifth defeat of the campaign, Celtic lead the Scottish Premier League by 19 points. And, when asked if the big lead was perhaps leading to a sense of complacency from his players, Lennon replied: "In some quarters it looked like that and that's what I'm not happy about."